A sequencing of the candidate genes of the pupils, exposed to strontium by the method of targeted resequencing has been performed. It is shown, that under conditions of increased revenues of strontium in drinking water the number of polymorphonuclear altered portions of candidate genes increases. As a result of the targeted resequencing in conditions of strontium exposure, the maximum polymorph modifications of the following genes are defined: sulfotransferase 1A1 (SULT1A1) and methylenetetrahydrofolate. It was shown that the structure of the mutations in conditions of the strontium exposure was characterized by the formation of defects in the gene mapping detoxification (38.5 % of all mutations) and immunoregulation (22.5 %). Analysis of the cause-effect relationships in the system "factor - the number of mutations" revealed that candidate genes reflecting strontium exposure conditions (content of strontium in drinking water is 1.3 MAC), are genes: cytochrome P450, glutathione - transaminase (detoxification); dopamine (CNS), interleukin 17 and the major histocompatibility complex (immune system), methylene-tetra-hydro-folate-reductase (reproduction). Vengerovskij A.I., Hlusov I.A., Nechaev K.A. Molekuljarnye mehanizmy dejstvija bisfosfonatov i stroncija ranelata [Molecular mechanisms of bisphosphonates’ and strontium ranelate's action]. Jekcpep. i klin. Fapmak, 2014, vol. 77 (9), pp. 43–46. (in Russian). Zaitseva N.V., Dolgikh O.V. Osobennosti kletochnogo zvena immuniteta u detej v uslovijah vneshnesredo-voj jekspozicii toluolom, formal'degidom, fenolom [Features of children’s cellular immunity in conditions of envi-ronmental exposure by toluene, formaldehyde, phenol]. Izvestija Samarskogo nauchnogo centra Rossijskoj akade-mii nauk, 2012, vol. 14, no. 5 (2), pp. 341–343. (in Russian). Zaitseva N.V., May I.V. K voprosu ustanovlenija i dokazatel'stva vreda zdorov'ju naselenija pri vyjavlenii nepriemlemogo riska, obuslovlennogo faktorami sredy obitanija. [On the issue of establishing and evidence of harm dealt to public health by identifying unacceptable risk caused by environmental factors]. Analiz riska zdorov'ju, 2013, no. 2, pp. 14–27. (in Russian). Dolgikh O.V. [et al.]. Immunnye i DNK-markery vozdejstvija tehnogennoj nagruzki [Immune and DNA markers of the anthropogenic load’s impact]. Vestnik Ural'skoj medicinskoj akademicheskoj nauki, 2012, no. 4, pp. 240–241. (in Russian). Dolgikh O.V., Krivtsov A.V., Gugovich A.M., Harahorina R.A., Lanin D.V., Lyhina T.S., Safonova M.A. [Immunological and genetic markers of aromatic hydrocarbons’ exposure to the workers]. Medicina truda i promyshlennaja jekologija, 2012, no. 12, pp. 30–33. (in Russian). Gorshkova K.G., Bubnova O.A., Maerova E.D., Dolgikh O.V. Immunologicheskie i geneticheskie markery vneshnesredovoj jekspozicii stronciem [Immunological and genetic markers of environmental exposure to strontium]. Sanitarnyj vrach, 2014, no. 3, pp. 72–74. (in Russian). Kutsenko S.A. Osnovy toksikologii [Bases of toxicology]. St. Petersburg. : Voenno-medicinskaja akademija im. S.M. Kirova, 2002, 395 p. (in Russian). Lanin D.V. Analiz koreguljacii immunnoj i nejrojendokrinnoj sistem v uslovijah vozdejstvija faktorov riska [Analysis of the immune and neuroendocrine systems’ regulation in terms of exposure to risk factors]. Analiz riska zdorov'ju, 2013, no. 1, pp. 73–81. (in Russian). Dolgikh O.V., Krivtsov A.V., Bubnova O.A., Danilova E.D., Sinicina O.O., Predeina R.A., Dianova D.G., Lyhina T.S. Polimorfizm genov belkov angiogeneza v uslovijah shumovoj i himicheskoj tehnogennoj jekspozicii [Gene polymorphism of angiogenesis protein in conditions of noise and chemical anthropogenic exposition]. Zdo-rov'e naselenija i sreda obitanija, 2013, no. 11 (248), pp. 42–44. (in Russian). Rahmanin Ju.A., Novikov S.M., Ivanov S.I. 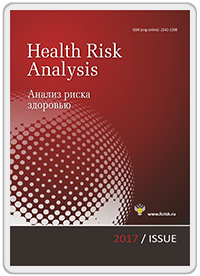 Sovremennye nauchnye problemy sovershenstvovanija metodologii ocenki riska zdorov'ju naselenija [Modern scientific problems of improving the methodology for assessing the risk to human health]. Gigiena i sanitarija, 2005, no. 2, pp. 3–8. (in Russian). Krzystyniak K. [et. al.]. Approaches to the evaluation of chemical-induced immunotoxicity. Environ Health Perspect, 1995, vol. 103, suppl 9, pp. 17–22. Descotes J. [et al.]. Assessment of immunotoxic еffects in humans. Clin. Chem, 1995, vol. 41, no. 12, pp. 1870–1873. Caverzasio J., Thouverey C. Activation of FGF receptors is a new mechanism by which strontium ranelate induces osteoblastic cell growth. Cell. Physiol. Biochem, 2011, vol. 27 (3–4), pp. 243–250. Descotes J., Vial Th. Immunotoxic effects of xenobiotics in humans: A review of current evidence. Toxi-cology in Vitro, 1994, vol. 8, no. 5, pp. 963–966. Dolgikh O.V., Zaitseva N., Dianova D., Krivtsov A. Molecular markers of apoptosis in industrial workers. In vivo: international Journal of Experimental and Clinical Pathophysiology and Drub Research, 2011, vol. 25, no. 3, pp. 523–524. Fromigué О., Haÿ Е., Barbara А. Calcium sensing receptor-dependent and receptor-independent activa-tion of osteoblast replication and survival by strontium ranelate. JCMM, 2009, vol. 13 (8B), pp. 2189–2199. Los M., Maddika S., Erb B., SchulzeOsthoff K. Switching Akt: From survival signaling to deadly response. BioEssays, 2009, vol. 31 (5), pp. 492–495. Mulder G.J. Metabolic Activation of Industrial Chemicals and Implications for Toxicity. Toxicology of industrial compounds. Taylor & Francis Ltd., 1995, pp. 37–44. Dolgikh O.V., Kharakhorina R.A., Dianova D.G., Gugovich A.M. State of cell regulation in children ex-posed to phenols. Proceedings of the 3rd International Academic Conference «Applied and Fundamental Studies», 2013, pp. 149–152. Yang F., Yang D., Tu J., Zheng Q., Cai L., Wang L. Strontium enhances osteogenic differentiation of me-senchymal stem cells and in vivo bone formation by activating Wnt/catenin signaling. Stem cells, 2011, doi: 10.1002/stem.646. Hurtel-Lemaire A.S., Mentaverri R., Caudrillier A., Cournarie F., Wattel A., Kamel S., Terwilliger E.F., Brown E.M., Brazier M. The calcium-sensing receptor is involved in strontium ranelate-induced osteoclast apopto-sis. New insights into the associated signaling pathways. JBC, 2009, vol. 284, pp. 575–584. Van Bladeren P.J., van Ommen B. Metabolism of Reactive Chemicals. Toxicology of industrial com-pounds. Taylor & Francis Ltd, 1995, pp. 61–72. Gervasi P.G., Longo V., Naldi F., Panattoni G., Ursino F. Xenobiotic-metabolizing enzymes in human respiratory nasal mucosa. Biochem Pharmacol, 1991, vol. 41, pp. 177–184. Yurchenko M., Shlapatska L.M., Sidorenko S.P. The multilevel regulation of CD95 signaling outcome. Exp. Oncol, 2012, vol. 34 (3), pp. 200–2011. Zaitseva N.V., Dianova D.G., Dolgikh O.V. Effects of cellular immunity in conditions of surplus supply of strontium with consumed water. European journal of natural history, 2014, no. 1, pp. 7–8.